From putting down his opponents on the judo mat, to bare-chested horseback riding, to travelling to the depths of the sea, Russian President Vladimir Putin has done it all! The Russian president teamed up on Wednesday night with his defence chief Sergey Shoigu and three Olympian champions for a game of Ice Hockey at Sochi’s Bolshoy Ice Dome. Any guesses who won the match? Take a look. Eyes on the puck! 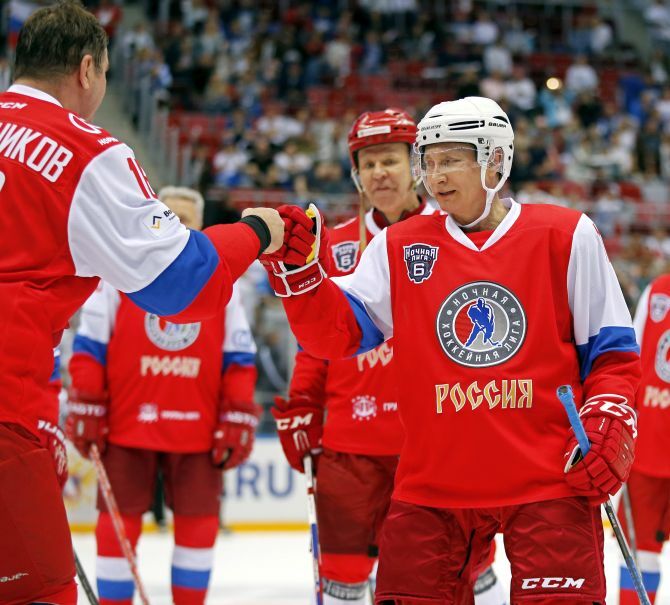 The 64-year-old Russian president started off well in the match with his jersey numbered 11. And he had a great fall... The Russian president takes a tumble during the game. Many around the world would be smiling at the sight of Putin on the floor, wouldn't they? Raising his game: Putin is an avid ice hockey player and his team boasted of chief Sergey Shoigu and three Olympian champions. Fist bumps all around: Putin was playing the game with business leaders in the winter resort of Sochi. Aim and fire! Putin is all ready to strike a goal. We have to admire his focus while playing.